Bidgigal artist and elder Esme Timbery comes from a long line of shell workers from the La Perouse community in Sydney. Like most shell artists, she learnt the art as a young girl from her older female relatives by first sorting the shells. In the 1940s, she joined the shell-working network and started selling her work. Today, her art can be found in many galleries and collections, including those of the Art Gallery of NSW. 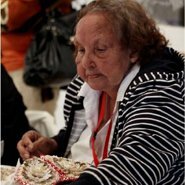 Learn from Esme Timbery about the materials and techniques used in the La Perouse shellwork movement in this talk to celebrate Corroboree Sydney 2014.